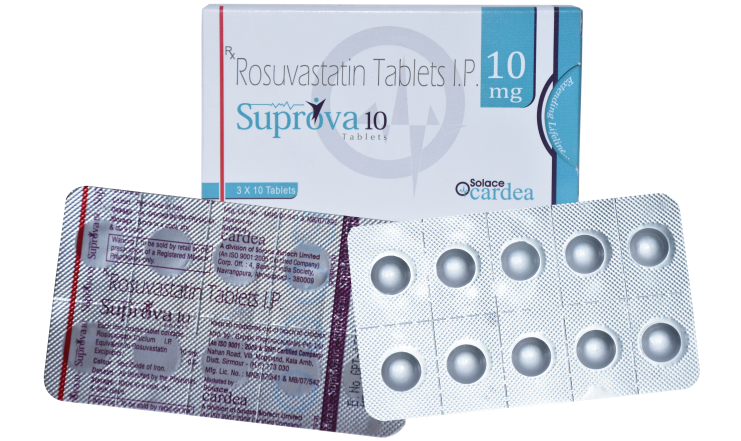 Suprova 10 tablet contains rosuvastatin . It belongs to the class of statins (HMG Co A reductase) which mainly use to treat high cholesterol. The drug produces its pharmacological action by inhibiting HMG Co A reductase enzyme. this enzyme mainly converts 3-hydroxy3methylglutaryl coenzyme A to mevalonate which is a precursor of cholesterol. It reduces the LDL and VLDL in body. After oral administration of the drug attains peak plasma concentration in 3-5 hrs. Approximately the bioavailability of the drug 20%. About 88% of the drug is bound to plasma protein. The mean volume of distribution of the drug is 134 liters. About 90% of the drugs excreted in feces. The elimination of half concentration of the drug is 19 hrs.